Summary (goodreads): Sixteen-year-old Deirdre Monaghan is a painfully shy but prodigiously gifted musician. She’s about to find out she’s also a cloverhand—one who can see faeries. Deirdre finds herself infatuated with a mysterious boy who enters her ordinary suburban life, seemingly out of thin air. Trouble is, the enigmatic and gorgeous Luke turns out to be a gallowglass—a soulless faerie assassin. An equally hunky—and equally dangerous—dark faerie soldier named Aodhan is also stalking Deirdre. Sworn enemies, Luke and Aodhan each have a deadly assignment from the Faerie Queen. Namely, kill Deirdre before her music captures the attention of the Fae and threatens the Queen’s sovereignty. Caught in the crossfire with Deirdre is James, her wisecracking but loyal best friend. Deirdre had been wishing her life weren’t so dull, but getting trapped in the middle of a centuries-old faerie war isn’t exactly what she had in mind . . .
Review: Well, if you’ve been here before you may have heard me mentioned that I absolutely love Maggie Stiefvater. I had been meaning to read this book for a while and finally have (first on my Nook, as well). I strongly believe that writers (every single one of us) gets better with every story. And she is not an exception to this rule. Though I enjoyed the story, I seem differences in her writing from this book to the Wolves of Mercy Falls trilogy to The Scorpio Races and finally to The Raven Boys. Boy has she really developed an amazing talent to create such real worlds. 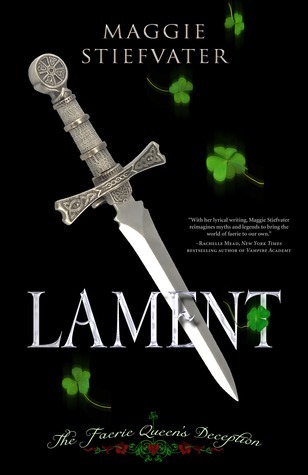 Lament was wonderful, I enjoyed the story. But the things that popped out at me were how underdeveloped certain aspects of her writing (the ones that I adore and admire) were. Which both bothered me and gave me hope that I will eventually be able to write better stories. I liked the ending. I was very happy to see that her first published book had the same quality of ending, in that she doesn’t allow her characters to get away unscathed. No one ever lives 100% “happily ever after”. There may be silver linings laying around, however. She also had a very strong female character (which I expected and was given). The emotion built throughout the book and by the end I cared about the main character, which (as I’ve said before) is the whole point. I disliked that there were so many “musical sessions”. i understand that the main character is awesome with the harp, but I had no idea how to imagine the songs she was playing. That being said, this aspect didn’t completely take me out of the story. I was still about to come up with something to imagine. This is due to the great description Maggie wrote. Recommendation: If you’re a Maggie fan, read it! If not, but you love faeries or harps, read it! If neither, maybe borrow it and see how the first few chapters treat you. My name is Alysha. I'm a reader, writer, day dreamer, cat owner, and food lover. Oh, you know, fun stuff. LIKE GIFS! A blog dedicated to books... the best hiding spot I've ever found.